This film is very loosely based on the TV series of the same name. Instead of being a police drama, they've taken the same basic setup and turned it into a rowdy comedy. Two young cops who were at school together are struggling at their job. 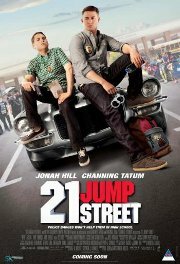 They get assigned to the 21 Jump Street program, which places youthful-looking cops into schools to uncover crime. Their first case involves a drug ring, and they manage to screw up their cover stories and take each other's places, with hilarious results. Note that this is not suitable for a prudish audience, or young teens. No persons under 16 (Language, Violence, Drug abuse). It's almost out! Pull a bit harder!